If you did a google query for such a specific antenna, that is the link that’ll probably drew your attention. ON4BAI disappeared from the ham radio scene almost a decade and a half ago. Since you don’t find an email address to contact him, your second go to was probably me. Understandable. Once or twice a year someone sends me an email about this antenna project. I decided to make my life simple and just refer to this here from now on. So read along. I guess that for ON4BAI it was an exercise in engineering, calculating and building. The object was to figure out a way to make a relatively small antenna work on a relatively large wavelength with relatively acceptable efficiency. Determine how high you are willing to go above the ground compared to full size (i.e. no loading). Determine how much space you want to sacrifice for the capacitance spokes. Add loading coils at feed point for more loading when capacitance spokes are not big enough. Figure out hairpin to match all this to 50Ω as lossless as possible. As a result: no it is not multi band. Everything is calculated for a single frequency. Bandwidth is not too wide either. If you want an engineering challenge and a complex antenna, this is the way to go. 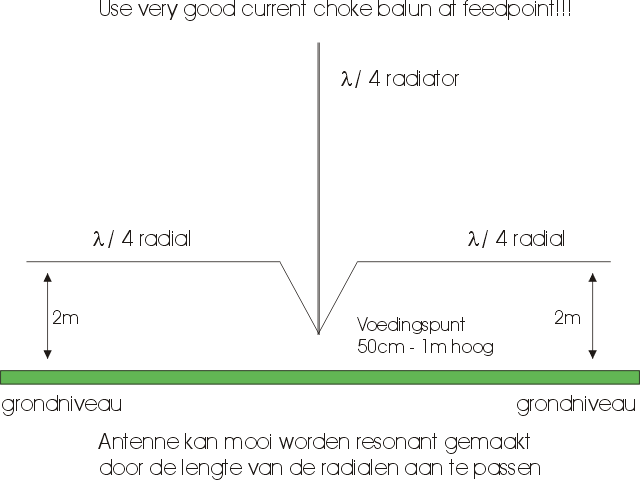 If you want a SIMPLE and LIGHT antenna that works EQUALLY WELL or better, there are other options. At my first employer I got to know ham radio because of some co-workers that were either hams or studying for their test. That tickled my interest. Later on I started working for another company early 1999. One of my co-workers there was ON4BAI. He was very passionate about the hobby and his enthusiasm was contagious. I too passed the test and he was my elmer when I took my first steps in ham radio. ON4BAI preferred the technical side of the hobby: designing and building. My XYL and I just bought a house and this OM was in need of some antennas. 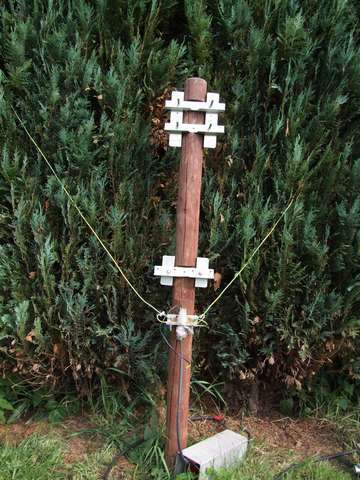 So Kurt designed and built this antenna and we put it in my garden. I used it from Spring 2003 to somewhere early 2006. I was very grateful for that as it brought me a good antenna for a nice band. For some reason we never got the SWR acceptable: 3:1 if memory serves me well. It seemed OK at his place but not at mine. Ground conductivity? Interaction with my sheet metal garage a few meters away? I used the TS-850’s internal ATU to ‘fix’ this. I was running 100W only so no problem. It brought me DX so why bother. My second problem with this antenna was actually that it took up quite some real estate and made lawn mowing difficult. Not only the capacity spokes were a danger to get poked in the eye. This antenna needs guying. The center is quite heavy: mounting plate, coils, balun and a coax attached. Early 2006 I bought an amplifier which could not handle this antenna because we couldn’t get it matched to 50 ohm. This was more serious than the lawn mowing issue so I decided to take it down. I replaced it with a simple wire vertical on a fiber glass pole with two elevated radials in gull-wing configuration. This worked equally well but was much simpler to build and took almost no space. I put the fiber glass mast against the hedge and used the trees to suspend both radials in. Later on I replaced the fiber glass pole with the copper wire by some tapered aluminum tubes. External images <here> and <here>. In summer 2006 I decided that maybe there was a better option when I had the telescopic tower cranked up. For WAECW 2006 I suspended a full size wire vertical dipole slightly sloping away from the 21m high tower. While not a three element yagi this antenna seemed even better than the ground plane. But yet again a simple, cheap and lightweight high efficiency antenna that didn’t take up real estate. Clearly a winner again. Later on a made an A/B relay switch and put up two of these. One towards USA and one towards JA with respect to the tower. They were not phased but I always thought of being able to ‘sense’ a subtle better performance in the favored direction. No measurements or tests to back up that hunch though. I used this setup on 40m with much success until 2011. Then I installed a coil loaded rotary dipole which sits at 23m AGL when the tower is cranked up all the way. This is a KILLER antenna and can’t be beaten for its size, weight and simplicity.